"Witnesses around the world have reported seeing monsters. Are they real? Or imaginary? 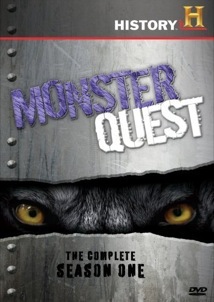 Science searches for answers...on Monster Quest." Monster Quest is a History Channel series that looks at mythical and/or elusive creatures (depending on your mind set), covering old reliables like Bigfoot and the Lake Champlain monster, as well as other things like creepy mutant canines, sharp-toothed killer fish, and something referred to as "flying man-eaters." Episodes run about 44 minutes without commercials, and each one focuses on a unique mystery. Utilizing interviews with assorted experts, eyewitnesses, alleged photo and film evidence, along with a dash of re-enactments and CG animation, the series trots out a pleasant mixture of science fact and keen skepticism as it analyzes these phenomena, often with a surprising level of honesty. The good news is that this isn't a trashy Fox reality show, eager to make everything overblown and sinister. Instead, it takes a seemingly well-researched approach, leaving viewers the opportunity to make up their own minds. Even-keeled or not, it is called Monster Quest, and odds are that if it caught your eye you already have a passing interest in one of the more mainstream subjects presented here: Sasquatch/Bigfoot (he/she gets two entire episodes). I imagine that this would be the wrong time to announce that at one point I actually wanted to become a khaki-wearing Bigfoot researcher (yes, alcohol may have been involved) and that I'm convinced there are probably more than enough unknown creatures lurking around out there that the possibility of a big stinky man/ape roaming the Pacific Northwest doesn't seem all that far-fetched. The highlight of these two episodes (and dare I say the entire series) is the technical analysis of the infamous Patterson film, including some very, very eerie photo enhancement work. Not all of the subjects necessarily require a Mulder-sized leap of faith, such as the existence of the humongous giant squid or the rumored black panthers supposedly roaming the woods of the deep south. Even during these much more plausible scenarios, however, the series still plays it cool, allowing viewers to ultimately decide if it could be fact or fiction. The lean is typically towards science here, and while the subjects all deal with some degree of the fantastic or undiscovered, the presentation refrains from being shrill or sensationalistic. The level of experts all present their cases well, offering up DNA analysis or other high-tech investigative tools, often smartly negating witness accounts. During America's Loch Ness Monster�which looks at the supposed Nessie-like creature living in New England's sprawling Lake Champlain�the only shred of photographic evidence gets the "it must be a log" treatment, and it's done with the sort of clinical explanation (buoyed by a little CG animation) to help sell the debunked theory. The two weakest links throughout these 13 episodes, however, are the use of re-enactments, usually combined with some occasionally sketchy CG work. Those two elements would usually have me reaching for the remote, but Monster Quest does employ them techniques somewhat sparingly, if that's any consolation. And given the overall logic and science approach of the series, these moments tend to tarnish a bit of the coolness of the whole thing, because some of the CG work is not just bad, but it gets reused a few times. I'm not a cryptozoologist, but I feel like I could become one after viewing Monster Quest. But that weird creature with two sets of wings that buzzes around in Unidentified Flying Creatures? I'm still not so sure about that one. Image Transfer Review: It's a little perplexing (and disappointing) that this 13-episode series has been released in nonanamorphic widescreen, and that's probably my biggest beef about this set. Not that this is a particularly eye-popping set of transfers�the eps consist of an assortment of source materials, so quality does vary quite a bit. Colors tend to waffle a little, though they are generally warm, with the interview segments of the assorted experts appearing the strongest. Audio Transfer Review: Audio is presented in a rather basic 2.0 stereo mix. Nothing terribly ornate here, but it is more than workable; clear voice quality�especially the deep rumble of narrator Stan Bernard�and no measurable hiss or distortion. Extras Review: This four-disc set is housed in an attractive steelbook case that has a brushed metal appearance. Inside, each panel houses two discs. Episodes are cut into six chapters, with no subtitle options. The only extra is entitled Bonus: Behind The Scenes (15m:54s), and it is a combo platter of material culled from episodes Sasquatch Attack, Swamp Creature, Bigfoot, Giant Squid Found?, Birdzilla, America's Loch Ness Monster, and Mutant Canines. The supplements are a bit light, but the packaging is very nice. I have to publicly slap the hand of The History Channel and New Video for releasing this set in nonamorphic widescreen, because that really detracts from the overall grade. The steelbook packaging is a nice plus, and the content is certainly nerd-worthy in an I-want-to-believe/Mulder kind of way, but the absence of anamorphic transfers just seems wrong. Fun stuff, and well worth a rental.